16.24% of all golfers in the US are a 7.9 handicap or lower. That means that with a 7.4 index, 15% are at my level or better and with 26 million golfers registering a handicap in the US there are about 3.9 million male golfers at my index or lower. This is a good news/bad news scenario. On the positive side, half way through my first year of actually playing full rounds with a full set of clubs I have gotten down to a level that 1 out of 6 golfers reaches. I know I had practiced the short game for more than a year before really starting rounds and that helped a ton, but the full-set rounds have only been since December 29. On the negative side, there are still 3.9 million men who are between me and the goal of earning a PGA Tour card. I’m not daunted by this, just looking forward to future improvements and whittling that number down to a more manageable chunk. The day that I break through the 4 handicap level there will be approximately 5 percent of golfers on my plain. Getting down to a 1 handicap will put me along the side of 1.25 percent of golfers. These are exciting numbers to shoot for and look forward too. For the time being, I’m happy to have equaled the level of the better 3.9 million golfers in the US. This number-thinking has me wondering how someone like me would stand up in a competition like the US Open going on right now. I’ve always thought it would make professional sports more interesting if you had an average person out there competing with the pros. Put your typical “swimmer for exercise on the weekends” guy in the lane next to Michael Phelps in the Olympics or my (or anyone’s) brother versus Lebron in a one-on-one basketball match. These kinds of additions to competition would make it clearer how amazing the pros really are. In the same way, having someone like me play Olympic during the actual US Open with a huge crowd and all of the distractions the players have to deal with would highlight just how tough these courses are. Take a 7.4 handicapper who shoots around 80 on local courses and drop him into this. Would he/I be able to shoot mid-80s? Or better? Perhaps the pressure would cause a 100+ meltdown. Hard to say, but it would be entertaining and paint a clearer picture of just how difficult these courses are and how good these guys are. 31 Responses to "Average golf handicap statistics"
Dan: Golf Digest and the USGA did collaborate in 2008-2010 allowing an amateur who was around a 10 handicap to play the course in it’s weekend setup. There were also three celebrity golfers in their group. I think Drew Brees who is close to scratch could not break 100 at Pebble. Congrats on getting to 7, that’s my long term goal! 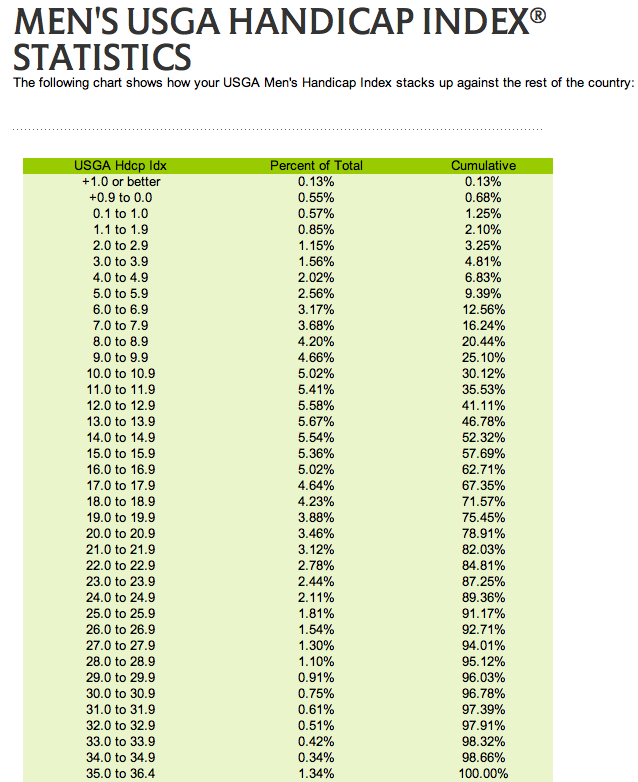 Clearly the USGA index is not based on the hardest course set-up in golf. This week Phil shot 7 over for the first two rounds, Rory shot 10 over. I think it’s a pretty accepted fact that tour courses (not even the US Open which is another ball park) are much more difficult than your standard public course. I’ve heard repeatedly that a 10 handicapper can’t break 100 on a US Open (I think tiger said it first). So 4 million golfers are at you your level or better. A really interesting stat to have with the above would be average amount of ‘deliberate practice’ for each handicap. From that you could calculate this thing we keep talking about, some kind of ‘talent coefficient’ This could then be used to predict your potential. Clearly someone that is a 3 handicap after 1500 hours of practice will have a higher talent coefficient than someone who is a 7 at 3000 hours of practice. That aside it would just be really cool to see how your skill compares to people that have put in similar amounts of effort. Question for you Dan, would it mean anything to you if that average amount of practice for someone at a 7 handicap was 1200 hours? It’s hard to imagine that 4 million golfers in the US at the same level as you having put in the same amount of time. What is practice? Is it hitting balls on the range, putting on the greens, hitting shots out of bunkers, … all using the principles of Deliberate Practice AND/OR is it playing rounds of golf? I ask this since 1200 hours could be playing 300 rounds of golf or it could be 1200 hours of Deliberate Practice in the practice area. These I believe will result in very different outcomes. I know people who have played golf for over 30 years and still can not break 100 (counting all the strokes like you do in competition)..while others like Greg Norman got to scratch in less than 2 years of practice and playing. So how does one count Deliberate Practice in the practice area versus playing a round of golf.. Each may take 4 hours of time. I’m looking forward to following Dan through the progression of USGA tournaments (presuming he doesn’t officially turn pro, before being eligible. The US Open requires a 1.4 handicap to enter qualifying. However that’s the top of the ladder. Then of course there are the various State contests. Dan, you have an interesting road ahead. This should be fun. Keep in mind, just for perspective, that many (most?) US male golfers don’t have an index. Of my foursome from this weekend, only two had an index and scores ranged from 87 to 105. I estimate that 90% of the golfers I know don’t have an index. I’d bet if you’re in the top 15% of indexed golfers, you’re in the top 5% of all US male golfers. Just looking around the golf courses, it seems quite impossible to me that 30% of the golf players is 10 hcp or lower!! The basis of the statistics maybe is just a fraction of the 26 Milliond golfers, and probably represents the best part of it. If this is true, Dan you have much less than 3.9 M golfers better than you! I have lots of thoughts about the above, but to get to the point, those are silly minimum guidelines for qualifying and entering qualifying for those tournaments the average person in each of those tournaments will be much better than that. and another thing… Everyone is still largely missing the point. Dan is exactly where the nay sayers said he would be after 3000 hours. To illustrate, Dan predicted 1000 hours ago after shooting an 83 that surely 1000 hours later his average score would be much better and he would be under a 3 handicap. Here are some things you may want to consider as you continue. First, it is true that your improvements in index will slow over time. It takes as long to get from 18 index down to scratch, as it takes to get from scratch to pro-level (+5 or so). Some of the previous comments on this post relate to this ideal. Of course, that’s a generalization. My son practices about 750 hours per year, with lessons. He has shown steady improvement of about 0.2 index points per month, from when I started tracking it when he was an 11 index. Your pace is somewhat more intensive than that, and you receive more lessons. So, you may improve quicker. But, he is much younger, too. My guess is you will be about 5 index strokes less at the next 1000 hour checkpoint. So, you will be about a 7. If you end up at 3, that will be something special, indeed. Wow, below a 3 handicap in 1000 hours… That is bold. If you do that I might start to come around. It shouldn’t happen though. Given the exponential learning curve of golf I’d venture to say that you might get down to a 6 or so but that jump from say, 6 to 4 might take you another 2000 hours and that jump from 4 to 2 the remaining 5000 hours. There’s still plenty of low hanging fruit out there but after you get to around a 6 handicap you’ve got to start jumping awfully high. I think anyone who’s gotten down to scratch the hard way (practicing a ton) will tell you that the move from a 5 to 2 handicap was more difficult then the move from 35+ to a 9 handicap. *people that think Dan will quickly drop from a 7 to a 5 and then a 3 just don’t get it. Dan is nearing a slow grind where it will start to seem nearly impossible to continue to improve. (and as I’ve said in the past, he will even struggle to stay where he’s at some point) Sorry Dan, I like you just balancing this thing out. You should let me write your 3000 hour blog post for being right. I love your work. But in all honesty after analyzing your swing and your ball distances, if you were to play the Olympic Club course tomorrow i’m picking you would battling to break 110. That course is ruthless! If I may interrupt this chorus of people telling you how screwed you supposedly are: let’s remember you’re not even at 3000 hours. In some of Ericsson’s research the “light practicers”/modest achievers had 4000 hours under their belts total. You’ve got a long way to go, and the sky’s the limit! Playing from the tips will lower your handicap like nobody’s business…..good job! I’ve got a driver for you to try! Been sitting in the basement for a couple years….might be right up your alley. Great job on getting the handicap down to a mid 7. Still lots of work to do to get to a +5 or so, but you are on the right track. Keep up the hard work and positive thinking. I’ve avoided making predictions in print — except for the over-the-winter handicap bet — and I’ll continue to resist the temptation. I do, however, hope that Dan has been plotting his index faithfully, the better to track his progress and to compare his predicted future index (by extrapolating) to the actual one, over time. To break the conversation a bit: this is fantastic. We have the notion of deliberate practice in my workplace but I never considered someone would be crazy enough to take it into golf. Massive kudos to you, and as stated earlier, a LONG way to go. I would love to do an article on this nearer the magic figure. I was looking at your stats page update. There’s a ton of data there but the layout is a little wonky. You should see if there’s a easy data-importing way to create a comparative chart or table to show the changes (improvement!) in each of the metrics categories at a glance so folks don’t have to scroll up and down between all the different data images. If there is somethign like that and I just missed it then disregard. First of all congrats on having the balls to go “all in” with the Dan Plan…definitely more than a little jealous about what you are doing. Anyway fyi I am based in Prague, Czech Republic and saw a spot about you on the Czech version of the Golf Channel…so news of your exploits has truly gone international. In my opinion at this stage of the Dan Plan your actual handicap is almost irrelevent. You (as I believe you are) need to be really focussed on the process of developing your game, handicap improvement will result as a consequence of this. If a player is totally focussed on simply lowering his/her handicap they can often sacrifice long term development of their game for a minor short term gain. I have seen plenty of players with low handicaps but who have poor technique. (I have a single figure handicap and am always frustrated when I get outplayed by one of these guys.) But the difference is they have much less scope for improvement or have already hit their limit. This is because whilst they may have imperfect swings they have over time been able to at least achieve a good degree of consistency as they have been swinging the same way for years. (ie. They have perfected the imperfect swing.) Which for most golfers is fine and as I said they can still get quite decent results. But in your case this is not going to get you where you want to go. By continuously working on your technique, making incremental improvements your swing is actually in a constant state of flux or change. This makes it more difficult for you to get the same level of comfort or consistency as someone who has been swinging exactly the same way for a number of years. It doesn’t mean that you won’t still keep lowering your handicap but you won’t get linear improvement. You will find you get stuck, even go backwards as you implement new stuff and then jump forward when it starts to kick in only to repeat the cycle when you make the next improvement. Whilst obviously you want to be shooting as low as you can I believe actual score or handicap should only become an important guide much further down the track after you have fully developed all your skills and are looking to pull them all together into a complete package. Shortly after Tiger’s comment that a 10-handicapper could never break 100 at Bethpage Black, I was invited to participate in a USGA outing at the course. I was playing to just over a 10 at the time and the course was still in tournament conditions – 6+ inch rough and we played it at just over 7,300 yards. I managed to shoot an 88 but felt like I was playing out of my mind in doing so. Had I not been straight off the tee that day, 100+ would have very much been in play. Can’t imagine what the pressure of the US Open stage would do to up the difficulty level. The course alone had me so nervous I tripled the first, though I’ll be the first to admit I shouldn’t have tried to cut the dogleg. I read the article about you in Golf Mag and have just started reading your blog so I don’t know if this info is already posted somewhere but I wonder from what tees you are playing from and how hard the average course? In the past 2 months I’ve gone from a 24 index to a 20.4. At my local course playing from the white tees I rate a 21 handicap. I know at one of the other course I play, I’m an 18 and yet a 3rd one I’m a 23. I try and play different tees to get a different experience from the courses, but the ones that I play most are either tips or blues, so they typically are rated around 72 130..
Dan, I just started playing – following the premise of your plan. In three months, I went from shooting scores well into the 110′s+, to shooting in the high 80′s/low 90′s (with a PR last weekend at 85). Immersion, focused practice, and dedication ARE the path to better golf – and beyond. Thanks again for inspiring the plan! Well, I guess I’ve missed my shot at taking money from you Dan. Well done! The USGA rule is a 3.4 handicap or less for the Seniors what is an average round shot for a 3.4 shooter? Low golf scores and thus low handicap indexes are more complex than pure talent and practice. I started playing golf 40 years ago at age 13. I played hockey, some rep level, and was a decent athlete, above average but not amazing at any sport in particular except maybe skiing. My mother put me on skis at two and was a decorated ski racer in the fifties. Athleticism, call it hand eye coordination or what have you, plays a big part in shooting low scores. However, there are human traits that can also enhance your game. Things like strategy, imagination and being a student of the game like Tiger Woods. There are a lot of things that are not God given that can have a great impact on your game regardless of raw talent. As a teenager, I managed perhaps a 12-15 handicap, never excelled as a junior and though I was improving, I never picked up the game like my brother. He has raw talent in all sports and took to golf quickly when he started dating a golf pros daughter. He had hands, amazing hands. 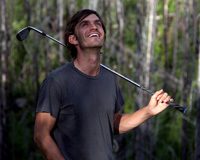 Within two years he was winning golf tourneys, at first just on sheer short game expertise. Not many have natural soft hands like this. He could get “up and down” from a locked VW. He is now the top teaching pro in Austria. He just turned 50 and missed the cut for the Senior British Open by one “horseshoe” lip out! This kid can play……He just shot 61 in Mexico on a course I had trouble breaking 80 on and I’m a four handicap. Anyway, the point I want to make is that as talented as my brother is, he plays smart. Educate yourself on the key fundamentals that all good players use. Strategize your golf round, analyze risk vs reward scenarios. The Fed Ex Championship was a classic example of taking your medicine and not giving the tournament away coming down the stretch. What a par….I might add. Great, smart and intelligent golf by that young man. Until you explore all the nuances of golf, you will not achieve your potential. I don’t practice, I play two times a week recently but have not had the time to really push the envelope of what I really can achieve in golf but I’m still learning and evolving. I recently shot a first round 67 in my club championship followed by a tournament blowout on Sunday of 81. I felt so good on the previous round, pure ball striking and confident. Sunday I didn’t feel good over the ball and this forced two bad decisions off the tee. One caused a quad the other a triple on a par five……very deflating. I could have recognized my Sunday dilemma and reacted differently and may have kept the round somewhat in check. I guess in closing I would again like to point out that there are many factors that determine a golf score, not just pure God given talent. I was recently beaten by a guy with the ugliest half swing chunks you ever saw. He played and practiced and somehow has found a way to get it done, even with poor fundamentals. It’s really not how……..but how many. Tee it high, and let it fly! Well don Dan for putting yourself out there. There is nothing worse than naysayers who sit on the couch! I reckon if you put the effort in and are 100% committed to improving all the time then you will make it. The pros as good as they are are also human and also started somewhere. Yes there are different levels of talent for sure but “hard work beats talent when talent doesn`t work” not sure who said that! Keep yourself strong in the gym and gain those extra yardages through suppleness. I agree with most. Most people don’t carry an index, so as one who has a <10 index it seems that most people fall higher. The index thing is fascinating in that you are only supposed to shoot your index 1 out of 4 rounds, and in the Northeast we get killed early season when posting season starts as we might have 6 months of non posting golf, seems we start all over again. To somebody’s point, course management is key. Risk vs Reward, leave the driver in the bag on short par 4 hit a long iron or hybrid. Play to the center of the green, don’t go flag hunting and miss to a hazard. I hate the term course management, handicap management.